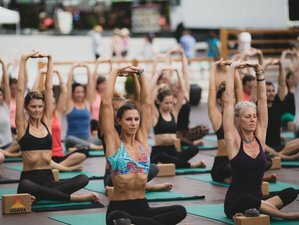 From the massive main stage to intimate workshops, celebrate your practice with a community of some of the finest and most diverse yoga teachers and musicians. You can drop into an invigorating Vinyasa class and flow to a live band or follow your bliss to a Restorative class. What are you waiting for? Book now and suit yourself by curating your own ideal yoga festival experience! During this program, you will be accommodated at Riu Pravets Resort. All rooms offer balconies and incredible views of either the sweeping mountains or the serene lake. The rooms also feature modern chic décor with luxury touches. You can stay with a friend or get extra cozy in a room all to yourself. Udaya's diverse community of teachers and musicians have been hand selected to create the best possible festival experience. The yoga of Udaya Live is inspirational and authentic, eclectic and reliable, passionate and powerful. From the massive main stage to mountaintops, to intimate workshops, your yoga environments will be aesthetically diverse and sonically sensuous. This program will take place at Riu Pravets Resort in Bulgaria. Your ticket includes 3 buffet meals a day with plenty of options for vegans, vegetarians, and carnivores alike. The spa includes fitness center, 312-square meter heated indoor pool, steam, sauna, hot tubs, hair salon, vitamin bar, oxygen bar and treatment rooms with a wide array of massage, and other beauty as well as relaxation treatments. Spa treatments are available at additional costs. Please book your flight to arrive at Sofia Airport (SOF) in Bulgaria. Shuttles from the airport to the Udaya Live Festival grounds at Riu Pravets Resort are approximately 45 minutes. Complimentary shuttle service is available on August 15 and 16, 2017. The deposit is fully refundable if the booking is cancelled up to 17 days before the arrival date. Udaya is an online yoga streaming service and creator of health and wellness programs. Udaya Live yoga and music festival is the annual event in Eastern Europe.